Gallery Place, Metro Center, Smithsonian and Union Station now have gold compass decals to guide passengers. Some people don't do well with directions, and now Metro is trying to help. The transit agency is installing compasses on the ground outside some of the busiest stations. Transportation reporter Adam Tuss explains how it works. Ever walked out of a dark Metro station and wondered for a moment: Which way am I going again? To help fix this problem, WMATA has installed compass decals outside four stations downtown. Gallery Place, Metro Center, Smithsonian and Union Station now have gold compass roses at each exit to guide passengers in the right direction. There are 10 compasses in total, Metro General Manager Paul Wiedefeld said. 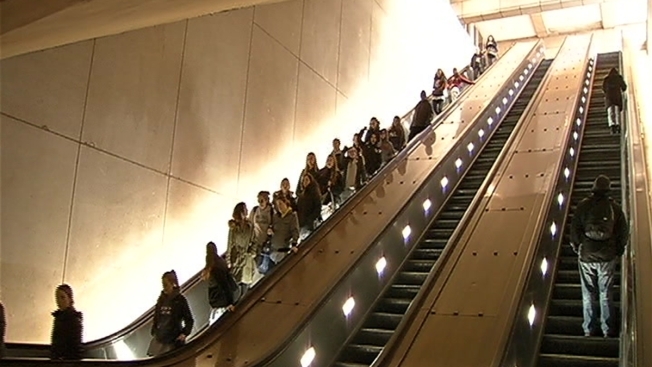 Greater Greater Washington held a contest last year, in partnership with WMATA, to find some ways to improve Metro. A teacher won the contest with her idea for the compass roses, Wiedefeld said. The compasses are now a pilot program, launching just in time for the cherry blossom season and the tourists that come with it.